Last Friday the market did not chop sideways with an upward bias as I thought might happen but instead dropped nicely in what I think will end up being an A wave down. 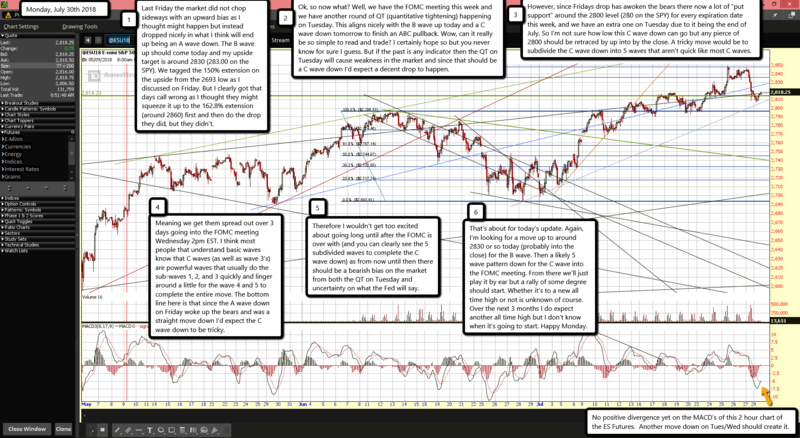 The B wave up should come today and my upside target is around 2830 (283.00 on the SPY). We tagged the 150% extension on the upside from the 2693 low as I discussed on Friday. But I clearly got that days call wrong as I thought they might squeeze it up to the 162.8% extension (around 2860) first and then do the drop they did, but they didn't. Ok, so now what? Well, we have the FOMC meeting this week and we have another round of QT (quantitative tightening) happening on Tuesday. This aligns nicely with the B wave up today and a C wave down tomorrow to finish an ABC pullback. Wow, can it really be so simple to read and trade? I certainly hope so but you never know for sure I guess. But if the past is any indicator then the QT on Tuesday will cause weakness in the market and since that should be a C wave down I'd expect a decent drop to happen. However, since Fridays drop has awoken the bears there now a lot of "put support" around the 2800 level (280 on the SPY) for every expiration date this week, and we have an extra one on Tuesday due to it being the end of July. So I'm not sure how low this C wave down can go but any pierce of 2800 should be retraced by up into by the close. A tricky move would be to subdivide the C wave down into 5 waves that aren't quick like most C waves. Meaning we get them spread out over 3 days going into the FOMC meeting Wednesday 2pm EST. I think most people that understand basic waves know that C waves (as well as wave 3's) are powerful waves that usually do the sub-waves 1, 2, and 3 quickly and linger around a little for the wave 4 and 5 to complete the entire move. The bottom line here is that since the A wave down on Friday woke up the bears and was a straight move down I'd expect the C wave down to be tricky. Therefore I wouldn't get too excited about going long until after the FOMC is over with (and you can clearly see the 5 subdivided waves to complete the C wave down) as from now until then there should be a bearish bias on the market from both the QT on Tuesday and uncertainty on what the Fed will say. That's about for today's update. Again, I'm looking for a move up to around 2830 or so today (probably into the close) for the B wave. Then a likely 5 wave pattern down for the C wave into the FOMC meeting. From there we'll just play it by ear but a rally of some degree should start. Whether it's to a new all time high or not is unknown of course. Over the next 3 months I do expect another all time high but I don't know when it's going to start. Happy Monday.